Plum trees, like other fruiting trees, benefit from a regular maintenance program of pruning, fertilizing and preventive spraying to foster the healthiest most bountiful crops. Plum trees are susceptible to several diseases and pests that not only damage the tree and fruit, but act as vectors to disease, so spraying plum trees on a regular schedule is paramount to their health. The big question is, when and what to spray on plum trees. Read on to find out. Creating a schedule for when to spray plum trees for insects is helpful if you are as absentminded as I am. You can do this by specific dates or, more importantly, maintain your schedule by the stage of the tree. For instance, is it in a dormant phase, is it actively growing or is it fruiting? Whichever works for you, the important thing is to stick to the annual spray maintenance schedule for when and what to spray on your plum trees. Giving an exact date or even a gist of one is difficult here since plum trees grow in different climates and microclimates, meaning that your tree might not need to be sprayed at the same time as my tree. Also, before you spray for the first time during a growing year, prune out last season’s new growth by 20% when the tree is in its dormant stage, as well as any broken or diseased branches. What to Spray on My Plum Trees? What to spray on your plum trees is as important as when to spray. The first application of plum tree fruit spray will be during the dormant period with, you guessed it, dormant oil for trees. This application will prevent aphid and mite egg production, and scale. It is applied BEFORE buds appear. The dormant oil should contain endosufan or malathion. 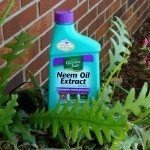 Keep in mind that dormant oil cannot be applied when a freeze is expected. If the temps dip below freezing, the oil can harm the tree. This is also a good time to apply Bacillius thuringiensis to the plum tree to keep oriental fruit moth and twig borer at bay. Once petals have fallen from the plum tree, check for aphids. 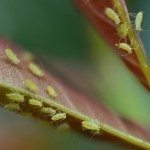 If you see aphids, spray either with neem oil, zinc sulfate, or add some dishwashing liquid to malathion and spray the tree concentrating on getting any curled leaves. At this time, spray a second time with Bacillius thuringiensis and fungicide. Once the fruit begins to develop and the husks are pulling back from the fruit, spray plums with spinosad, esfenvalerate or permethrin to control the twig borers. Spray again with a mix of fungicide, malathion and sulfur to control leaf curl, plum pocket, scab and brown rot and aphids. Spray every 10 days during fruit development. STOP spraying a week or so prior to harvesting. Your local extension office or a good nursery can help you further to create a schedule for spraying plum trees and offer advice on products and/or non-chemical options for controlling disease and pests on your plum tree.